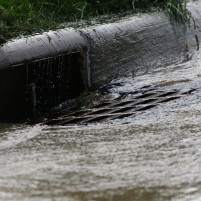 The girls, both 14 years old, entered the storm drain at Clark Avenue and Orcutt Road. They walked for about a quarter mile while the storm drain was dry. After the heavy rain began, the teens became trapped in a vault inside the drain with six inches of flowing water preventing them from safely escaping. At about 2:37 p.m., emergency personnel received a call about the situation. Santa Barbara County firefighters responded, found the teens and removed a storm grate near the intersection of Orcutt Road and Patterson Road. Responders lifted the teens out of the drain and gave them medical attention. The girls reportedly did not suffer any injuries, and they were released to their parents at the scene. Subjects: Orcutt Rescues Santa Barbara County Fire Department Santa Maria Save! Three people drowned in the Arizona desert this summer when they we hit by flash floods. People seem to have trouble understanding how fast water can run. Wanna go ride bikes? No Wanna go to the mall? No Wanna go to the movies? NO Want do you wanna do? I dunno… ummm…let’s go play in the storm drain…awesome!!!!! Their teachers had probably encouraged them to walk a mile in homeless people’s shoes (or a 1/4 mile) in order to better understand their plight. We should all live in creeks and storm drains for a while to teach us more empathy for the drug addicts who populate these places.